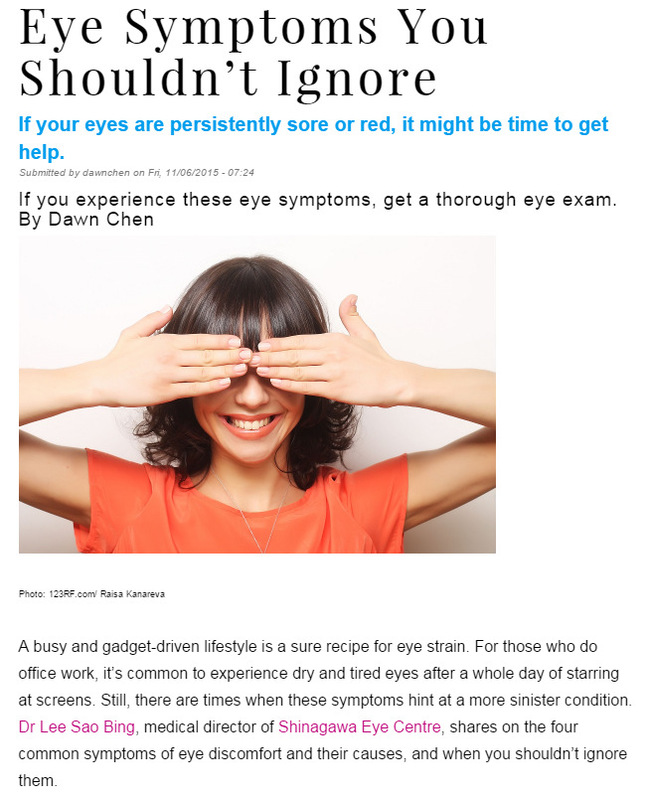 Dr Lee Sao Bing was interviewed for this article in Shape Magazine about several eye symptoms: Blurred / cloudy vision, Redness of the eyes, Floaters and Eye pain. Read on to learn more. Tired and dry eyes can occur quite frequently, especially as a result of fatigue or eye strain. But if you experience only blurred vision in one eye, or if the blurry vision is persistent and unrelenting, it could be time to get help. If only part of your visual field is affected, this could signal a more serious underlying brain condition as well. In such cases, do not hesitant to see your ophthalmologist (eye doctor). Eye redness can be caused by eye allergies – especially if you already have a sensitive nose – or because of environmental irritants such as dust or exposure to the haze. If your eyes are too dry or strained, the tiny blood vessels in the whites of your eye can break too, leading to bloodshot eyes. If you experience other accompanying symptoms like pus, burning or swelling together with eye redness, see a doctor as soon as possible as you could be suffering from an eye infection or conjunctivitis. Floaters are tiny specks or spots that drift across your vision. “As we age, the gel-like material (vitreous) that fills the inside cavity of the eye degenerates and causes clumping of this gel-like material,” says Dr Lee. “They move as your eyes move and seem to dart away when you try to look at them directly.” But while those floating specks may be disconcerting, they’re generally not a serious issue. However, if you see a sudden onset of persistent floaters and flashes, make an appointment with your eye doctor soonest.